You are here: HomenextNew contributionsnextPeter Gibbons – ‘Birchlea’ Bridge Avenue, Langdon Hills. Peter came to Memory Day at Laindon Library for the first time on Saturday 29th September 2018. He had walked all the way from the Dunton Caravan Park where he now lives. Originally from Romford, his family had owned a weekend bungalow in Bridge Avenue, Langdon Hills. Peter’s father Frederick Gibbons married Rosina West in 1929 in St. Olave, Bermondsey. 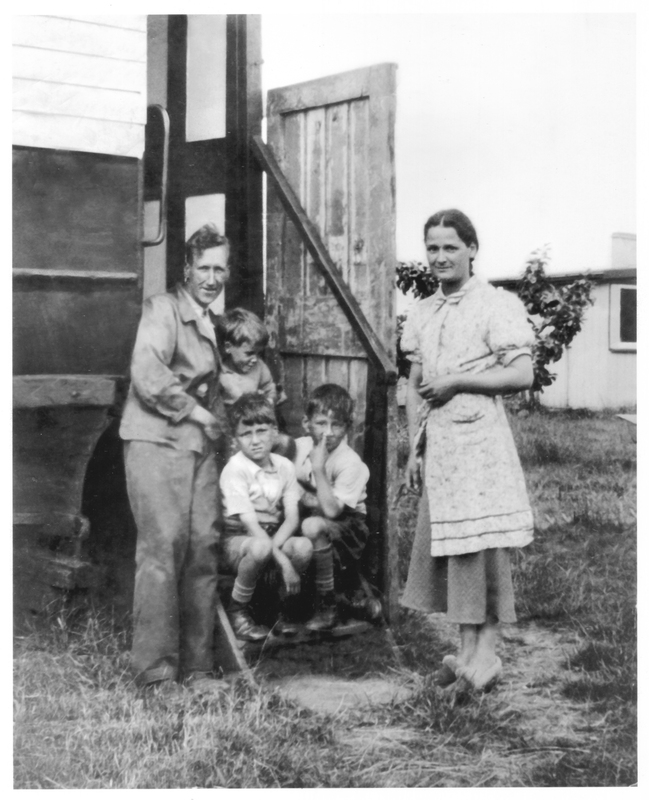 Peter’s Grandmother, Mary West purchased three plots in Bridge Avenue in the 30s and the family were soon spending their weekends and holidays in Langdon Hills. Unfortunately, Peter couldn’t recall the name of the bungalow but he does remember that his father installed an old railway workman’s carriage next to the bungalow which was used for extra accommodation (this had probably been used on the road rather than on the railway track). It had once been quite smart and fitted with gas lamps. When various family members came to stay, they had to sleep wherever they could be fitted in. Peter remembers a number of concertina type camp beds being used for the purpose. A marquee was sometimes erected in the garden and also a Union Jack which could be seen from a good distance away, which would help guide visitors from the train station to the bungalow. Peter remembers milk being delivered in churns which was scooped out into jugs and a little shop along the road which was often visited by the local children to buy sweets. He also remembers being sent to a local hardware store to buy a very delicate gas mantle. He carried it carefully in both hands held in front of him and was relieved when delivering it home safely, still in perfect condition. After some research I have been able to establish that the bungalow was called ‘Birchlea’ (Miss Marple strikes again) and it stood on the north side of Bridge Avenue, with the Dunton Farm Colony just a short distance away on the other side of the railway track. The Electoral Register shows Peter’s great uncle Thomas West was living in ‘Birchlea’ during the late 50s and early 60s. 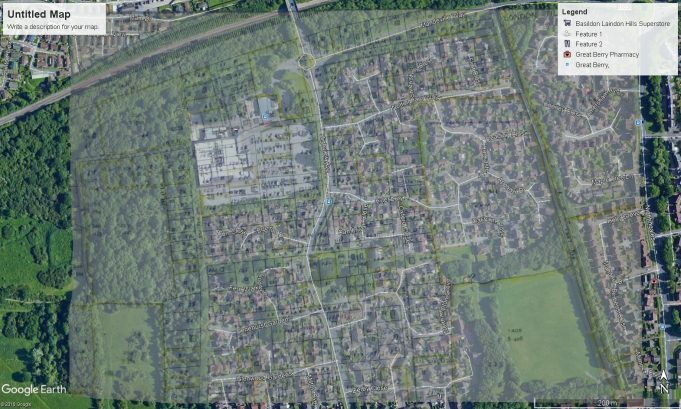 The area was later redeveloped and Mandeville Way now runs through the plot where ‘Birchlea’ once stood. Peter told us that he had never imagined that he would end up living just a stone’s throw from where his family’s weekend bungalow had once stood. At the door of the railway vehicle. Frederick and Rosina Gibbons with sons, Peter on the left, Jack on the right and Billy above. Flying the Union Jack in the garden of ‘Birchlea’. Billy in the front, Peter in the middle and Jack at the back. 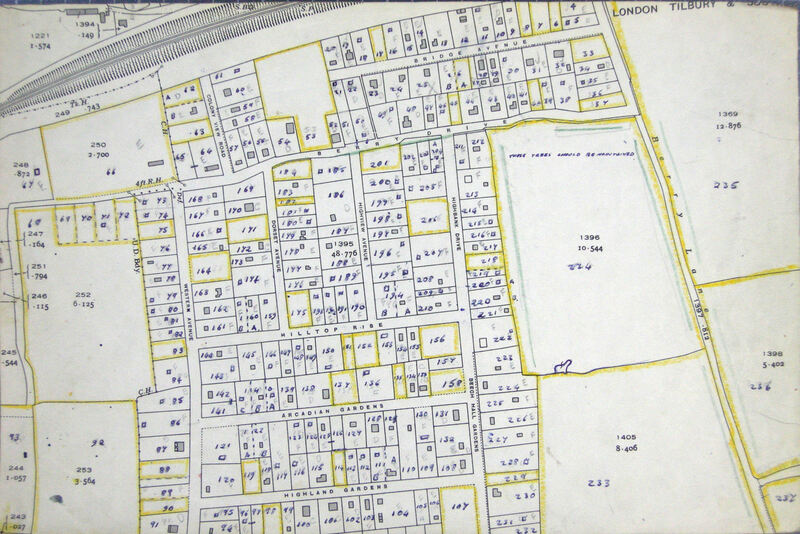 Basildon Development Corporation’s 1949 survey. 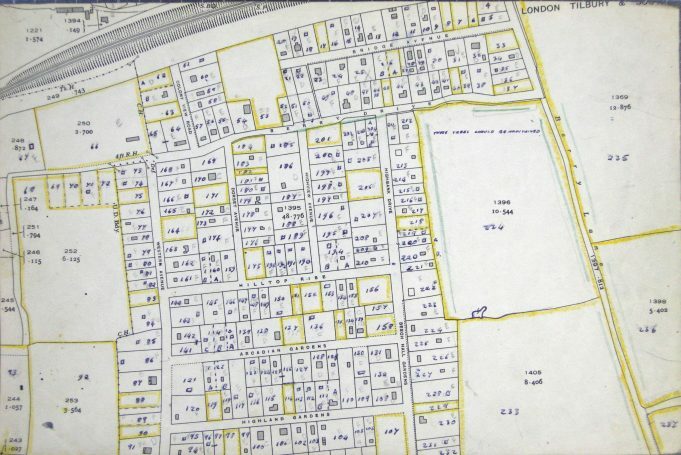 ‘Birchlea’ is plot No 12 – top of picture and to right of centre The survey describes ‘Birchlea’ as a weekend residence, made from timber and asbestos tiles. In fair condition on a well-kept plot. Overlap map showing Mandeville Way now running through the plot where ‘Birchlea’ once stood.